No matter what climate you live in, or what time of year it is, it’s always sweater weather in the office. 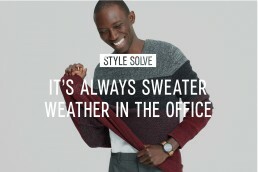 Nothing combats the chill of the 65-degree thermostat while simultaneously keeping you presentable to the rest of the working world quite like a nice knit. For that reason, you want to pay as much attention to your sweater drawer as you do your suiting wardrobe. A single moth-eaten crewneck is not going to get you through one work week, let alone the fiscal quarter. We say start with the basics and build on from there. Here, five completely different, all equally cool sweaters to set the foundation. Wear one every day of the week if you chose. The only thing your colleagues will notice is that your style is on point—and you look mad comfortable, too. As much as office dress codes have relaxed over the years, most still aren’t 100% fleece-wear friendly. (And even if they are, do you really want to be that guy?) Knit hoodies are great because they feel just as comfy as your weekend fleece but look a lot more polished. In fact, you can even wear it under a suit for a sporty twist—just add sneakers. Whether you’re a fan of Ivy League style or love the oversized chill of a ‘90s knit, having a sweater in your closet that nods to your favorite decade will make getting dressed on cold winter days less of a drag. Just be sure mix the sweater with your more modern, polished pieces before heading into the office. The great thing about a Henley sweater is that it’s polished enough to fly at the office, but casual enough to work on the weekend too. Plus, that open collar will keep you cool, calm, and collected no matter how stressful things get at work. Try styling it with monochromatic tones while you’re on the clock to keep the look firmly out of lumberjack territory. Whether you like your stripes big or small, nautical or modern, this is a must-own sweater. That’s because it turns your most basic chinos and trousers into an outfit, while never veering too far away from classic. As if the staple could get any better, remember this: horizontal stripes across the chest will make it look like you’ve been hitting the gym extra hard. A stack of solid-color crewnecks isn’t the worst idea, but don’t sleep on the plain V-neck either—especially if you plan to go collar-free. A v-neck layered over a crewneck T-shirt and chinos is a recipe for a “promote that guy already” office flex. If you want to snazzy things up for a date, lose the T-shirt and show a little skin or add a pendant necklace to encourage your date to lean in a little closer.